The smartest, the cheapest or the most popular: All you need to know before buying an electronic chess set. Electronic chess board may not be the first thing that comes to mind when you think of buying a chess set, but they can actually add a lot to your game when used properly. When hooked up to your computer, they can allow you to play through famous games in chess history, or even play games with friends from a distance when you can’t get together. Electronic chess boards offer a drastic improvement over typical online chess because they allow you to actually hold the pieces in your hand and see the whole board laid out in front of you rather than relying on a point and click interface. The high quality electronic chess sets on this reviews list have features that allow you to actually track your progress in real time and improve your chess skills at a faster pace, whether you’re playing against an opponent, a program, or on your own. If you’ve never played on an electronic chess board before, you’re in for a treat. They open up a whole new world of chess with their vast functionality and multiple abilities. The DGT Revelation II is a state of the art DGT chess board. This electronic chess board is simply the best that money can buy, and the price certainly reflects that fact. It is for serious chess players only – those who are willing to put a significant investment into making their chess game more and more competitive. The Revelation II can act as a totally independent unit and does not need to be hooked up to another computer in order to function, though it does have the option to do so if you choose, which allows you to back up your played games for easier sharing and storing. 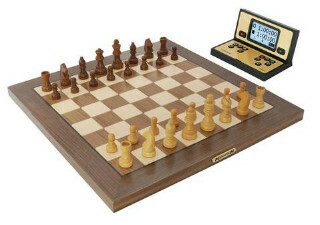 The luxurious wooden playing surface of this digital chess board houses a powerful integrated chess computer beneath, with a readout display prominently featured on the top side of the board. It features digital sensors to determine the moves being made as well as inlaid LED lights to indicate your opponent’s moves. The DGT Revelation II features an OLED display, large buttons, and LED lights to indicate your opponent’s moves. This board is programmed to be usable in several different languages and for several different purposes. For example, you can use it to play against the strongest chess programs, broadcast your games live over the internet, or play against human opponents located anywhere in the world. And you can do all this with the comfort and familiarity of a wooden board with elegant, hand carved chess pieces of your choosing. Another unique feature of this specific board is the ability to add on the optional Retro Emulation software, making this board both future proof and backwards compatible at the same time! Broadcast your games live over the internet, or play against human opponents located anywhere in the world. Overall, this is our top recommendation in the electronic chess sets category. It is hands down the best and most advanced digital chess board & computer available on the market today, though not everyone will be able to afford its hefty price tag. If the price is not an issue for you, we say buy without hesitation! Retro Emulation Software – Available at an additional cost, the Retro Emulation Software allows users to emulate nostalgic chess computers from the 1980’s and 90’s. 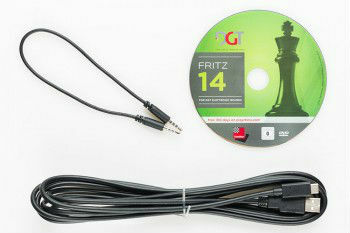 DGT FIDE Electronic Chess Pieces – A set of DGT Electronic Chess Pieces comes included with your purchase. Our favorites are the weighted DGT FIDE pieces, which cost a little extra but are well worth it. 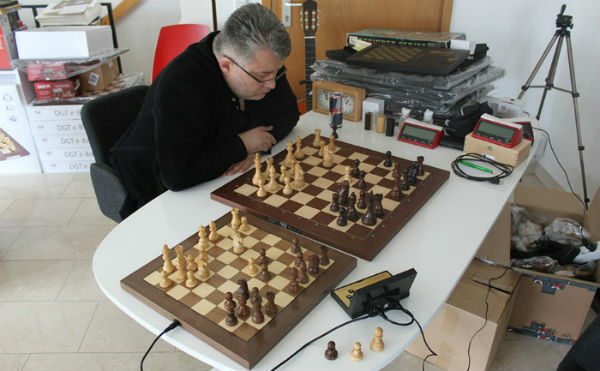 The DGT Electronic Chess board is the top of the line when it comes to digital chess boards. DGT is a well respected, long time manufacturer of various products for your electronic chess games, and they’ve proven time and time again that they can be trusted to deliver the highest quality electronic chess products. This DGT Electronic Chess Board is packed full of features and functions that can teach chess players of almost any level how to improve their game. Even if you have only the most basic understanding of chess, you can hone your skills by playing against chess programs such as ChessBase, Rybka, Fritz, Hiarcs, Nimzo, Junior, and more. More advanced players aren’t left out, either. The game analysis features and stored memory function allows you to get feedback on all the games you play with this board, complete with suggestions on how to take your game to the next level based on alternate pathing. Basically, it works by having the computer analyze all the potential moves you could have made during the game but didn’t, and gives you recommendations based on which ones would have been most successful, according to its calculations. You can also play against stronger and stronger chess programs, like the award winning Pocket Grandmaster 2.0. The DGT Electronic Chessboard comes in a USB or Bluetooth model. 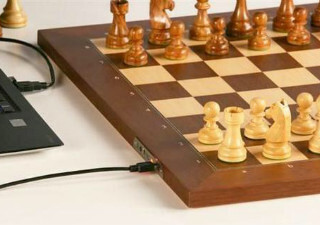 It hooks up to a computer where it works seamlessly with several different chess programs. ChessPad, Chess Assistant, TOMA, BlitzIn, and more are all fully compatible, with more and more integrations being added all the time. You can complete the set with your choice of chess pieces, though some may come at an additional cost. We recommend using this set in conjunction with the DGT PI chess clock to get the most out of all the features included with the digital chess board. Pairing this board with the matching chess clock is the best way to take advantage of the board’s full functionality. The clock displays your opponents moves as well as marking the time for each player. The move display alone lets you focus more on the game at hand and prevents you from having to look back and forth between the board and your computer. After all, one of the main draws of an electronic chess set is that it brings the real chess experience to online chess, so the more focus you can keep on the board and off the computer, the better. The DGT PI chess clock adds a small additional cost to your package in exchange for a huge boost in functionality. The clock can also be used independently of the board, so you can use it with any of your chess sets. The DGT PI adds a small additional cost to your package in exchange for a huge boost in functionality. We think it’s more than worth it. DGT PI Chess Computer – To get the full functionality from your electronic chess board, you’ll need to pair it with the DGT Pi Chess Computer, which is available for an additional fee. Carrying Case – Protect your investment with a custom DGT carrying case in black or red. The small additional upfront cost will keep your electronic chess board safe and sound for many years to come. Millennium is another trusted brand name when it comes to electronic chess boards and other digital chess products. This board comes at less of a premium price than the DGT chess board, making it a great choice for those on a budget. We don’t recommend trying to find an digital chess board much cheaper than this one, though. Not only is stock extremely limited and hard to find at those lower prices, but anything you do find will likely not be of a suitable quality. If you want to buy an electronic chess set, you want it to have all the features and functionality that makes electronic chess sets desirable, but you’re not likely to find it at that price. For lower budgets, we recommend either saving up a bit longer or buying a regular chess board. We made sure that this set preserves all the functionality of the more expensive sets, offering you the best value available. It can analyze your games in real time, be adjusted to various playing levels, propose moves and evaluate positions, and so much more. Everything you need in an electronic chess set, this baby can do. This product also comes as a full set with everything you’ll need, including wooden chessmen, a chess computer, a power supply, and a complete set of easy to follow instructions. This is an ideal electronic chess set for a beginner who’s just getting started with chess and wants to improve their skills as quickly as possible. ChessLink – The ChessLink device, sold separately, allows you to connect your Millennium chess computer to your tablet, phone, or PC, enabling you to access more chess engines as well as online play. This budget friendly electronic chess board has all of the features and function of the regular DGT e-boards, it only lacks some of luxurious look. That’s because this smart chess board is made out of a lightweight and durable plastic rather than the natural wood that DGT uses on its other electronic chess boards. To those who are more interested in form over function, this fact alone could be a dealbreaker. But, if you’re looking for a good digital chess board that will get the job done, and you don’t care about looks, the DGT Smart Board electronic chess board is a great option that won’t break the bank. This product was designed to make electronic chess sets more accessible to people with smaller budgets, and we think it’s great that DGT accomplished that by scaling back some on the finishes rather than taking away from the actual features and functionality of the electronic chess board itself. This way, the cheaper version can still do everything that the more expensive versions can. It also offers a good money saving option for buyers who just don’t care much about the materials their digital chess board is made from. Also in the Box: USB-C, Board to Clock Cable, and a DVD containing installation software & drivers. The DGT Smart Board is also more compact and portable than other versions, making it perfect for travelling. It has a smaller footprint at only 20.5 inches square, with spacious 2.165 inch squares. The durable plastic is also lighter and easier to transport than wood, and you won’t need to worry about it getting scratched or damaged. This electronic chess set includes a set of plastic chess pieces as well, and it comes in a version with labelled coordinates and one without, depending on your preference. 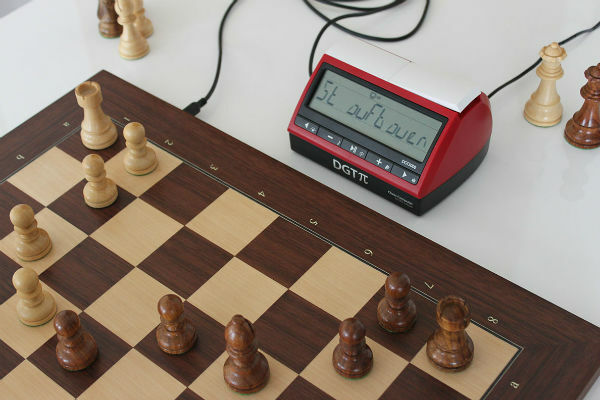 It can be used along with the DGT 3000 Chess Clock to display moves during computerized chess games, but its full potential is only unlocked when paired with the powerful DGT Pi Chess Computer. 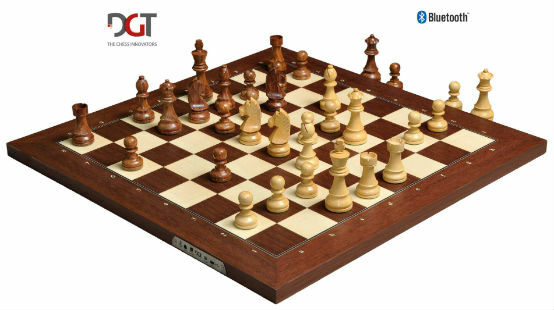 DGT Pi Chess Computer – A separate chess computer will be necessary to fully utilize your DGT Smart Board, and this is a great one at a good price. DGT Electronic Chess Pieces – A plastic set of electronic chess pieces can be purchased with your DGT Smart Board, but we recommend upgrading to the DGT FIDE weighted chess pieces for an additional cost. Carrying Case – Spend a little extra to add a custom carrying case for your DGT Smart Board. It will keep everything organized and protected during transport or storage. 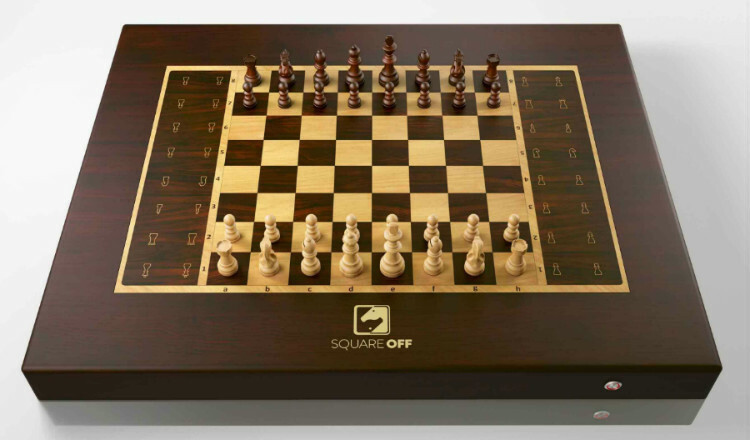 The Square Off Digital Chessboard is being marketed as the world’s smartest chessboard, and once you see it move its pieces across the board all by itself, you’ll understand why! While this is a cool feature, this board is actually the least “smart” on this list in terms of computational chess power. If you’re looking for a serious, feature-packed digital chess board that will help you strengthen your chess game, this isn’t the board for you. The Square Off product is more for casual players and kids who want a new toy with a fun gimmick. Nevertheless, it is a gorgeous and well made product. The luxurious Rosewood chessboard and handcrafted chess pieces give the appearance of an antique chessboard, but a closer look at the board’s high tech features quickly dispels that illusion. This is a board that you can show off to your friends! The Square Off automated chess board is the perfect product for a tech-loving chess player who likes to have the latest and greatest toys. While someone who is more focused on seriously improving his chess game may opt for the more professional DGT digital board, Square Off is perfect for more casual players who just want to have a little fun and enjoy the game. And Square Off can definitely bring the fun! With its unique app, you can connect to friends and family anywhere in the world to sit down for a game of chess. 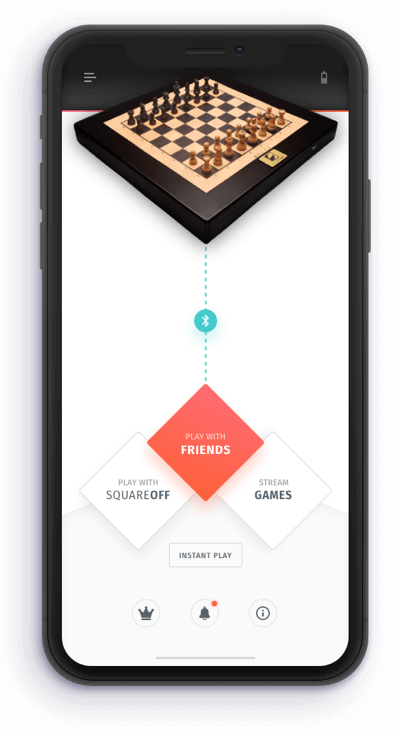 Each set connects to its player’s phone with Bluetooth low energy, and the app connects the two players over an internet connection. The pieces will communicate each move to the app, which will then broadcast that information to the other computerized chess board. That board will then automatically execute your opponent’s moves, so it will be almost like they’re really there playing with you! If you don’t have anyone to play against, don’t worry- you can play against the board itself. The Square Off Digital Chess Set runs Stockfish 8, which lets you play on any of 20 different difficulty levels, ranging in ELO from 800 to 3000. The Square Off digital chess set comes in two different versions. The first is the Kingdom Set, which is just under 19 inches square. Its battery has enough charge to last for 15 games, but this set is missing many of the features that make Square Off such a cool product, like auto reset and live streaming functions. It is available at a cheaper price, but we think if you’re going to buy for this product, you should spring for the fully functional version. The Grand Kingdom set is the fully functional version. It is larger and more feature packed than the regular Kingdom set. Its battery lasts twice as long- up to 30 games on a single charge, and it includes the very cool auto-reset feature that sends all the chessmen scurrying back to their designated spots on the sides of the board at the press of a button. You can also live stream your games with this board via the app, and for all of the extra functionality that you get, it’s really not that much more expensive. Plus, you can use our exclusive coupon code CHESSSITE at checkout to get 10% off your order and bring the price down even lower. Electronic chess boards are a big purchase that needs to be properly thought out. When you’re spending that much money on a single purchase, you want to be sure you’re getting the right thing! Luckily, we’ve taken all the guesswork out of the process for you with this curated list of the best electronic chess sets out there. If you buy from this list, you can rest easy knowing that you’re getting a great product without having to go through all the trouble of researching all the hundreds of available options out there. The few electronic chess boards that made it onto our reviews list were selected after meeting our rigorous criteria regarding their reliability, functionality, and overall value. You would hate to splurge on an expensive digital chess board only to have it break or become obsolete within a year, wouldn’t you? Everyone would! That’s why we only select electronic chess boards from trusted brands that stand by their products. In the unlikely event that you get a lemon from one of these brands, we’re confident that the company will make it right for you. The boards on this list also feature a certain amount of future proofing in the form of regular software updates and replaceable hardware that make it possible to upgrade your computerized chess board a little at a time as new technology comes out instead of having to keep buying new ones. The few electronic chess boards that made it onto our list were selected after meeting our rigorous criteria regarding their reliability, functionality, and overall value. There are a few standard functions that any good digital chess board should have, like real time analysis of games, ability to store played games in memory automatically, and ability to play against computer software as well as online opponents. All of our boards have these features and more. Finally, there’s the matter of value. No matter what the price, you want to make sure you’re getting what you paid for, and all of the boards on this list deliver on that. When you’re playing against a human opponent, these boards offer real time analyses of the games to give you insight into how you’re playing and how your game can be improved. This is a great feature for beginners to have access to and can help you improve your play drastically in just a short amount of time. These boards offer real time analyses and allow you to go over each game after the fact to look for ways to improve in your next game. If you prefer to do the analysis yourself, you’re in luck! 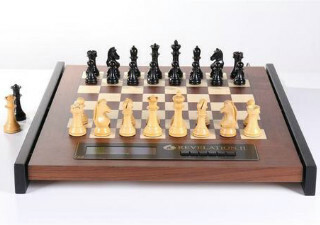 Each game that you play on an electronic chess set is automatically stored, move by move, in the memory of the computer powering the board. This allows you to go over each game after the fact to look for ways to improve in your next game. You’ll be able to see the moment your opponent started setting up the trap you eventually fell into, or how you missed a move early in the game that would have made things play out differently. It’s great information to have for anyone who is serious about improving their chess game. And there is so much more functionality built in to each of these boards! You’ll be occupied for weeks just exploring everything that your new digital chess board can do. It can be difficult to grasp just how much an electronic chess board can change your game before you experience one, but trust us- once you try it out, you will never want to go back! You forgot the Certabo, a board from Italy. No mention of SquareOff. I guess because it wasn’t reliable when we bought it. Please keep me up to date about chess computers. (and checkers computers too).